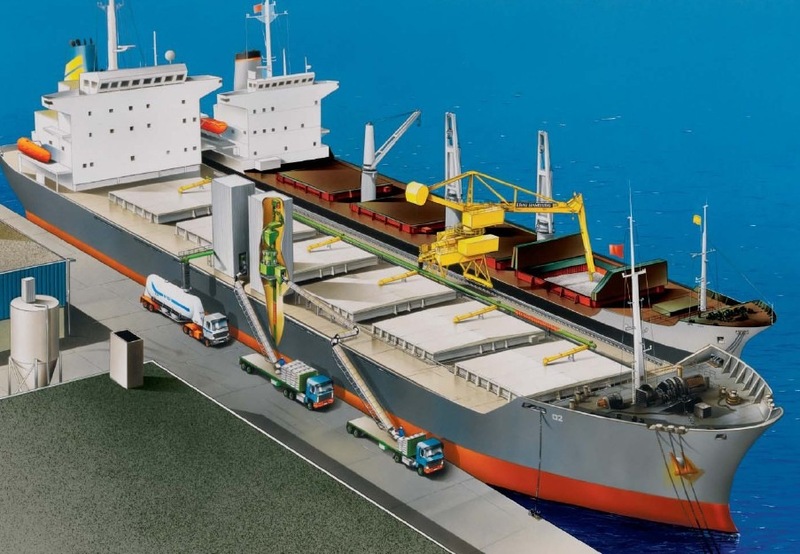 Ship can be used as Floating Cement Terminal (FCT) also. can be easily berthed in harbours and can be operated without any shore based buildings or facilities. can be chartered for a short period of time, to handle temporary peak cement demand. can receive cement from ships carrying cement and with integrated packers, both bulk and bagged cement can be loaded directly to trucks or rail wagons for further distribution. can be self propelled or non self propelled floating terminals. some of the countries operating FCT are: Nigeria, Libya. BUA Cement 1 Terminal, Nigeria. designed specifically for bulk and bag unloading for BUA International Limited. in operation from September 2008.
the vessel is 200 metres long and has a storage capacity of 40,000 metric tonnes. the vessel is equipped with a Siwertel ship unloader capable of receiving cement at a rate of 800 metric tonnes per hour from incoming cement ships. is capable of bagging with four packers with each packer capable of packing 120 metric tonnes per hour. the floating terminal has an overall daily capacity to park and discharge 11,520 metric tonnes of high quality BUA cement in 50 kilogram bags. 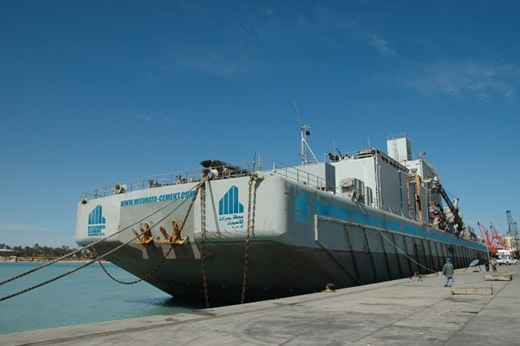 Misurata Floating Cement Terminal . operates in Misurata harbour, Libya from February 2008.
is a barge equipped with 16,000 metric tons capacity. can supply as much as 4,000 tons of cement per day. facilities include two bag-packing machines, three lorry loading conveyors to unload 50 kg bags directly into trucks on quay and equipment to load bulk cement directly into 30 to 60 tons bulker trucks. now Sri Lanka is also planning to have such terminals in Colombo and Galle harbours. on cement carriers and marine terminals, log on to IBAU Hamburg. on self and non self propelling floating cement terminals, log on to SeaBulk Shipping S.A.
on BUA Cement 1 Terminal, log on to NOM (UK). log on to Misurata Floating Cement Terminal. Above illustration of Floating Cement Terminal is from IBAU Hamburg and the photograph of barge as FCT is from Misurata Cement.